The MX-E3T3 is a brand new TDM/PDH multiplexer equipped for 16 or 21 E1-2 Mbps to an E3/34 Mbps or T3/DS3/45 Mbps link or 28 interfaces T1/1.5 Mbps to a T3/DS3/45 Mbps link. This equipment is useful for Telco, Military, Energy and Transport domains to carry and distribute E1/T1 links from high speed transport like Microwave Radio links at 34 or 45Mbps. The copper version of MX-E3T3 can distribute E1/T1 when connected to a high level switch TDM/PDH E3/DS3 or directly connected to an E3/DS3 interface of a SDH/SONET equipment using VC3. Traffic can be carried transparently over fiber optic modems like the FO-E3T3 or 34Mbps/45Mbps microwave radio systems in a clear channel mode. EA new fiber optic version with redundant ports will be available Q3 of 2009. 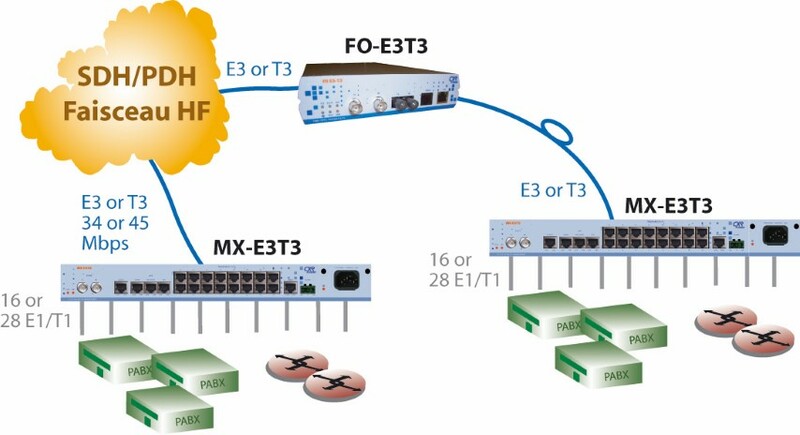 Optical and copper versions of MX-E3T3 can be interconnected over networks and FO-E3T3 fiber optic networks. The MX-E3T3 includes three Ethernet interfaces, one for SNMP management, one for VoIP EOC and an Ethernet 10/100BaseT Ethernet bridge. The copper version has a maximum Ethernet bandwidth of 2Mbps and the fiber version has a maximum Ethernet bandwidth of 45Mbps. The MX-E3T3 is a compact 19’’ device 1U for 16 E1 and 2U for other models with redundant AC or DC48v power supplies.